IN THE coming months, the 26 Counties will hold a referendum on the Lisbon Treaty. The treaty is the most significant revision of the structures, procedures and policies of the EU since its foundation. It is vital that republicans understand the treaty and are able to debate the issues involved. Recent Eurobarometer and Irish Times/MRBI polls indicate that Irish attitudes to the EU are changing. People are becoming more critical of the direction of the European Union. A majority of the 26-County electorate has yet to make up their minds on the treaty. In the coming campaign every activist has a role to play in convincing friends, family, work colleagues and neighbours of the reasons why this treaty is bad for Ireland and the EU. 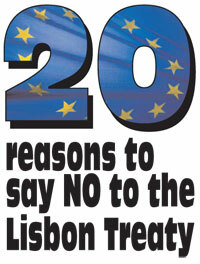 Here’s 20 reasons to reject the treaty. 1 The Lisbon Treaty agreed by EU leaders in November 2007 is almost identical to the EU Constitution agreed by EU leaders in 2004. The Constitution was democratically rejected by the electorates of France and the Netherlands in referenda in the summer of 2005. They objected to the undemocratic and right-wing content of the Constitution. That EU leaders have returned with the same text in a different format is undemocratic and is an insult to the democratically-expressed wishes of the peoples of France and the Netherlands. 2 Article 46 of the Lisbon Treaty states: “The Union shall have a legal personality.” This is a major change to the legal basis of the EU because it transforms it from an arena of co-operation between democratically-elected nation states to a legal entity in its own right. ‘Legal personality’ would enable the EU to operate in the international area like a state, which it currently does not have the power to do. It could have its own diplomatic corps, negotiate and sign international trade agreements, incorporate existing international treaties into its own law and seek a seat at the United Nations. 3 Under Article 9 of the Lisbon Treaty the European Council changes from an inter-governmental body to a European Union institution. Rather than act in the interests of the nation states who elect them, this change would mean that the Council would “aim to promote its [the Union’s] values, advance its objectives, its interests”. These values, objectives and interests are not determined by any election but by existing and future EU law. As the Commission is responsible for drafting EU legislation and has what is known as the “power of initiative”, such “independence” simply means a complete absence of accountability from any elected body, whether at a national or at an EU level. 5 Article 48 of the Lisbon Treaty gives the EU powers to amend its own treaties, without recourse to an inter-governmental conference, a new treaty or a process of national ratification. Until now, revisions of EU treaties required these three stages, ensuring that national governments and, in the case of Ireland, national populations are involved in the decision-making process. Article 48 dispenses with this and allows the European Council to make amendments by unanimity, without any process of national ratification. This means that, in the future, significant changes could be made to the structure, procedures or competencies of the EU without any recourse to a referendum. 6 The Lisbon Treaty contains a further eight articles which enable the European Council to extend specific powers in specified policy areas, including moving Common Foreign and Security Policy from unanimity to qualified majority voting, harmonisation of criminal law, and extending the powers of the European Public Prosecutor. 7 In total, the Lisbon Treaty transfers 105 new competencies from the national to the EU level. These cover a wide range of policy areas including foreign, security, defence, trade, justice and economic policy. No argument has been made to support this transfer or why these areas should be dealt with at an EU rather than national level. It is the single largest transfer of powers in the history of the European Union. 8 A further 68 areas which are currently competencies of the EU will move from unanimity to qualified majority voting (QMV) at the European Council. This will increase the degree of majoritarianism at Council and reduce consensus decision-making. 9 The Lisbon Treaty alters the way decisions are taken at the European Council. The already complex qualified majority voting procedure will be changed. The result is that Ireland’s weighted voting strength will be reduced by more than 50 per cent. At the same time, the threshold determining a qualified majority will be significantly reduced. Taken together, these changes will reduce the power of smaller states and increasingly replace consensus decision-making at Council with majoritarianism. 10 In addition to these significant procedural changes, the new treaty also contains significant policy changes delivered in a deliberately opaque manner (lists of complicated amendments to two existing treaties), meaning that there will be insufficient public scrutiny or debate as to the implications of such changes. Transparency and clarity are vital if people are to fully understand the treaty. Without such understanding, how can people make informed decisions about such profound changes to the way in which our lives are governed? 11 The Lisbon Treaty further consolidates the right-ward direction of economic policy while simultaneously undermining public services and workers’ rights. The European Union and the Lisbon Treaty do not talk about public services. Rather they divide services into two categories: (1) Services of General Economic Interest, and (2) Services of General Interest. While there is no definition of Services of General Interest, current EU case law defines economic activity as the offering of any goods or services on the market. By this definition, all current public services would fit into the Services of General Economic Interest rather than Services of General Interest. Article 16 of the Lisbon Treaty places new “economic and financial conditions” on the provision of Services of General Economic Interest (these are detailed in Articles 86 and 87 of the existing treaty). These conditions mean that services – including health care and education services for example – would be subject to the rules of competition. Protocol 6 of the Lisbon Treaty mandates the EU to ensure that “competition is not distorted”. This provides the EU with a mandate to remove “distortions” from the provision of services. Such “distortions” could include state aid, public funding, protective markets, health, environmental and workers’ rights regulations and state “monopolies”. Combined, this complex procedure allows for the complete undermining of the welfare state and the Social European Model. In its place it promotes deregulation and privatisation. Social democratic defenders of the Lisbon Treaty point to its Protocol 9, arguing that this excludes public services from such rules. However, as there is no definition of Services of General Interest in this protocol or anywhere else in the treaty this is clearly not the case. 12 Article 2/2 introduces “price stability” as an aim of the European Union for the first time. While no one could object to measures to curb inflation, if the inclusion of price stability is used as a tool to limit member states’ public spending, or to restrict member states’ budget deficits, then clearly it could have a negative economic role. Equally, if price stability were to conflict with other aims such as full employment or social progress, it would be the European Court of Justice who would determine which aim has precedence rather than democratically-elected member state governments. While it is unclear, at this stage, the inclusion of price stability could have the impact of forcing member states to reduce public spending, further undermining the provision of public services and other policy tools aimed at combating poverty and inequality. 13 Articles 10 to 28 of the Lisbon Treaty advance EU control over foreign, security and defence policy, increasing the militarisation of the EU and further eroding Irish neutrality. Article 11 mandates: “The Union’s competence in matters of common foreign and security policy shall cover all areas of foreign policy and all questions relating to the Union’s security.” Article 27 mandates for the “progressive framing of a common Union defence policy [that] will lead to a common defence” (Article 28b). While decisions on matters of foreign, security or defence policy will be taken by unanimity, Article 17 specifically allows the European Council to act by qualified majority voting in foreign and security policy. Like the internal market before it, this is the beginning of the transfer of control of foreign, security and defence policy to the EU. 14 Article 28c mandates: “Member states shall undertake to improve their military capabilities.” Taken with the “start-up fund” and “specific procedures for guaranteeing rapid access to appropriations... for urgent financing of [unspecified] initiatives in the framework of the common foreign and security policy” (detailed in Article 28d), member states will be obliged to increase their financial contributions to the military capabilities of the EU. 15 Article 28/7 reaffirms that “commitments and co-operation” in the area of common security and defence “shall be consistent with commitments under the North Atlantic Treaty Organisation”. This effective alignment to NATO is not balanced with any commitment to protect the neutrality of member states such as Ireland. 16 The Lisbon Treaty also fails to significantly address the issue of climate change, despite arguments from the Irish Government. The Government secured the inclusion of the six words at the end of the existing provision “promoting measures at international level to deal with regional or worldwide environmental problems, and in particular combating climate change”. This addition is purely symbolic, without substance and, considering the global urgency of tackling this issue, does nothing to advance the EU’s commitment to seriously tackle the issue. It does not empower the EU to do anything it could not currently do under existing treaty provisions. 17 Article 2a gives the EU exclusive competence over commercial policy, including the negotiating of international trade agreements. Article 10a mandates the “progressive abolition of restrictions on international trade” to be one of the EU’s guiding principles in its interaction with non-EU member states. At present, the EU is seeking to force developing world countries to abolish what are known as “beyond borders controls” such as tendering restrictions and environmental or workers’ rights regulations, irrespective of the consequences of removing such controls. Taken together, these two elements signal a significant backward step in the EU’s approach to tackling global poverty and inequality. 18 Protocol 12 of the Lisbon Treaty, dealing with the European Atomic Energy Commission, states that the treaty “should continue to have full effect”. One of the primary goals of this treaty (knows as EURATOM) is the promotion of nuclear energy. Irish people reject nuclear energy. The Lisbon Treaty, like its predecessors, mandates the EU to promote nuclear energy. 19 Defenders of the Lisbon Treaty argue that it will make the EU more efficient and democratic. They argue that it gives more power to national parliaments and citizens and greater human rights protections. They say that a post-enlargement EU cannot function under its present system. All of these arguments are untrue. The provisions dealing with national parliaments and citizens are cosmetic and are completely diluted by the massive transfer of power to the EU level detailed above. The Charter of Fundamental Rights adds no new human rights protections and its application is heavily circumscribed by national and EU law. The EU has continued to function without crisis or collapse since enlargement. These arguments are being used to distract attention from the 19 points listed above. 20 Defenders of the treaty also argue that rejecting the Lisbon Treaty will see Ireland isolated and marginalised within the EU. This is an attempt to bully the Irish electorate into accepting the treaty despite its dangers. In 2005, the people of France and the Netherlands rejected the same text. These countries were not isolated or marginalised; nor would Ireland be if we voted no. • Assists the developing world overcome global poverty, inequality and disease. The Lisbon Treaty does none of these things.